Coconut oil has more uses than a Swiss Army knife! It’s got health benefits for your body inside & out, it’s delicious and it can even help around the house! What makes coconut oil special as opposed to many other oils is that it’s a healthy saturated fat which is made mostly of medium chain fatty acids. This kind of fat is easier for your body to digest and use as energy, rather than storing it as fat around your middle. It’s not just about fat and calorie content. It’s about how your body reacts to them. Eating coconut oil can help your liver and kidneys. It has a beneficial anti-inflammatory effect on those organs. 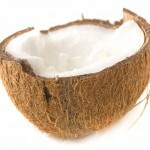 Healthy fats are also key in maintaining your brain function and coconut oil can help prevent deterioration from age. Coconut oil is great for thyroid and adrenal glands and your pancreas. It can help balance your hormones and diabetics have reported a positive influence on their insulin levels after swapping less healthy fats for easily digested coconut. In addition to all this, it’s helpful for good digestion, heart health and weight loss. I promise I’m not trying to oversell you on snake oil. This is not a miracle medicine, or a complete cure for anything, but all of the above benefits are possible from making this substitution in your diet. Extra virgin, minimally processed coconut oil is the best of the bunch. Add it into your diet as a cooking oil, butter substitute on toast, or a tasty smoothie supplement. Its high smoking temperature actually makes it a breeze to cook with! Don’t be fooled by the fact that it mostly comes looking white & solid. It melts at a very low temperature and then it’s clear and liquid enough for any cooking use. When you make a mess around the house, it’s so handy to be able to just grab coconut oil from the pantry and feel like MacGyver! Sticky oil build-up on your stove, cabinets or exhaust hood? Fight that oil with more oil. Mix up a paste of ½ coconut oil & ½ baking soda for the perfect combo of dissolving and abrasive power. Follow up with a regular kitchen cleaner to remove any leftover oil & you’re done! The above recipe is also useful as a rug and upholstery stain remover! Make sure to test this on an inconspicuous spot first to make sure it won’t leave its own mark. If that’s fine, then apply a minimal amount to the mark and then rub it – and the stain – away! Some surfaces may be too porous for this treatment, but in most cases it’s very effective. If your tools, scissors or knives get rusty, coat them with coconut oil and then leave it to sit for an hour before washing. if the damage isn’t too extreme, the rust will be removed! If you need to remove sticker residue from glass or other hard surfaces, first let some coconut oil loosen up the stickiness before scrubbing with conventional cleaners. If you get an ink stain on plastic or vinyl surfaces, coconut oil will rub it away. When it comes to beauty & health, you’ll be amazed by just how many products you can stop buying if you just use the coconut oil. Spent too long out in the sun? Moisturizing with coconut oil will not only soothe, but heal your sunburn. It can restore the lipids you’ve lost when you burn because it contains lauric acid – a common ingredient in skin care products that’s often used to prevent redness and irritation. No more tight, itchy skin as you heal & you’ll smell great! Don’t wait til you’re burned to moisturize with coconut oil. It’s a fantastic everyday moisturizer and it’s beneficial for many skin complaints – including psoriasis and eczema. if you want a thicker mixture, try combining it with shea butter for a super-powered skin treatment. It can also fight acne with a natural antbiotic boost. Mix it with a little tea tree oil and some honey for an all-natural blemish fighter that won’t leave dry red spots behind. It’s a very effective and gentle makeup remover as well. It’s safe all over your face and works like a miracle on waterproof eye makeup. It also works as a great carrier oil for your favorite essential oils, so you can make custom scented moisturizers or massage oils. It makes a wonderful cuticle oil, and thanks to its natural anti-fungal properties, it can prevent ugly nail fungus on your hands and feet. Whiten your teeth by swishing around coconut oil like a mouthwash, or make a whitening tooth scrub with equal parts oil and baking soda.